Explore flower parts first hand with this fun activity where children will dissect the parts of a flower and tape them to their sheet. 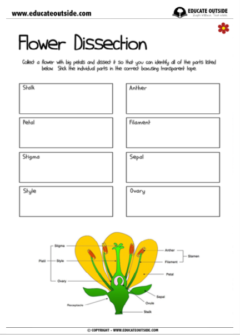 It is a great way to start your topic and get children excited by plants! It's best to encourage them to find flowers with big petals as this make them easier to dissect. Daffodils and tulips work well. Let us know how you got on with this activity. If you wish to discuss this resource in detail please use the discussion forum.